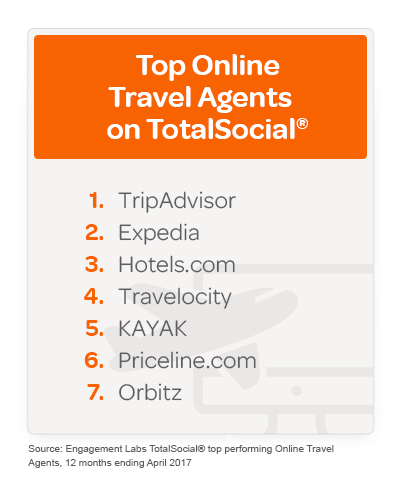 June 20, 2017 08:30 ET | Source: Engagement Labs Inc.
NEW YORK, NY--(Marketwired - June 20, 2017) - In a new, first of its kind analysis of combined offline and online consumer conversations, Engagement Labs released its TotalSocial® rankings on the top performing online travel agents (OTA) in the U.S. The rankings are based on Engagement Labs' proprietary TotalSocial data, which continuously measures the most important drivers of brand performance with respect to social media and word of mouth conversations. The analysis finds that the OTA category as a whole performs better in terms of offline (face-to-face conversations) as compared to online (social media). Also, the brands in the OTA category perform better in terms of offline brand sharing -- which is the amount of face-to-face conversations in which people are talking about a brand's marketing or advertising -- as compared to online, via the brand's social media pages. These statistics become incredibly interesting due to the sheer amount of time consumers spend on searching online travel sites, including OTAs. A recent study conducted by comScore found that, on average, travelers in the U.S. made 140 visits to travel sites in the 45 days prior to booking a trip. Engagement Labs' analysis finds that TripAdvisor is the clear leader, performing better than its peers both offline and online. TripAdvisor's top ranking is driven by its strong online volume and online sentiment scores -- which means consumers are having a large amount of positive conversations about the online booking tool via social media. In addition, TripAdvisor performs above-average in terms of offline brand sharing, which might be attributed to its recent return to TV advertising after a two-year absence. However, there is room for improvement when it comes to its online brand sharing scores, which presents an opportunity for the company to create and post more shareable content on its owned social media pages. "Despite the fact that consumers are booking their travel or vacations online, its clear that individuals move fluidly between online and offline lives, talking about their travel booking experiences in face-to-face conversations," said Ed Keller, CEO of Engagement Labs. "Even today's digital-first brands, such as online travel agents, must pay close attention to consumer conversations occurring offline as well as online." A number of OTA brands such as Expedia, Hotels.com and Travelocity have higher volume scores offline as compared to online, which shows that consumers are talking about these travel websites in more offline conversations as compared to via social media. For brands such as Expedia, their online campaigns can successfully generate an offline buzz. For example, the online booking company launched a series of documentary-style videos on social media before being aired on TV, resulting in a higher volume of offline conversations. Meanwhile, the brands finding themselves at the bottom of the rankings include KAYAK, Priceline and Orbitz. These three brands' TotalSocial scores are brought down by their substantially lower volume scores, which are especially lower in terms of offline volume, presenting a clear opportunity for improving how much conversation each brand is getting online and offline. To learn more about Engagement Labs or its TotalSocial insights, and how to increase your brand's word of mouth in real life and online, reach out at: totalsocial@engagementlabs.com. Engagement Labs (TSX VENTURE: EL) is the world's first TotalSocial® company, offering intelligent data, analytics and insights for marketers. We are leaders in tracking, measuring and benchmarking the impact of conversations happening around a brand and industry -- both online and offline. Consumer conversations are a proven driver of critical business outcomes, including sales. The patent pending TotalSocial data solution provides brands with unique insights and powerful analytics to understand online and offline social impact and drive business results. TotalSocial demonstrates to marketers how their online and offline conversation compare and contrast and helps identify areas of competitive opportunity or significant emerging threats. TotalSocial is an "always-on" proprietary scoring system, based on the most important drivers of brand performance: Volume, Sentiment, Brand Sharing and Influence. TotalSocial was built on the pillars of Engagement Labs' patented social media measurement tool and the world's only offline word of mouth tracking system for brands and tracks 500 brands within the U.S. across 17 major industry categories, and 350 brands in the UK.